Anchor’s Willow Gardens care home in Yateley, Hampshire has had the latest cutting edge technology installed in its home. Tovertafel (‘Magic Table’ in Dutch) has already proved a huge hit with residents following its installation last week. 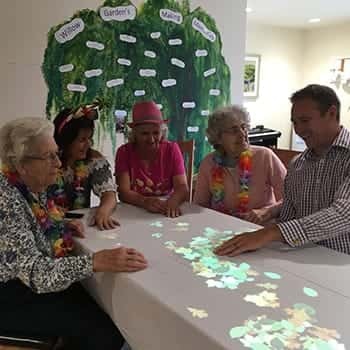 The visual Tovertafel games can be played independently or in groups and have been researched and designed alongside people living with dementia so that they exactly match their needs. Taking part helps with health and quality of life and the Tovertafel can create amazing moments of happiness for staff, family members and loved ones alike. Angela McCormack, the home manager said: “This ‘Moving Image’ device has already seen some outstanding results from our residents. There is no doubt it is helping those living with dementia, but it has other benefits too; it helps others improve their hand/eye co-ordination and one of the most delightful things to see is the total joy it brings to residents playing the simplest of games."